The family and I took off on Friday morning after Brett's PT to visit some friends in Camdenton, MO and meet their new addition! We loved seeing little Poesy and her teeny, tiny fingers and her teeny, tiny face and teeny, tiny yawns. I kept telling Katie and Johnny I had completely forgotten babies started out that small. Ruby looked huge next to Poesy and was trying really hard to 'play' with her. Thanks, Katie and Johnny for letting us visit and drop off some goodies! P.S. Hope has the coolest bed fort but it sounds like it's about to get even cooler! After our visit we went exploring through town and hit up a few of the thrift and antique stores that Katie and Johnny had shared. Brett occupied Ruby while Sebastian and I went looking for treasures and we both found some fun things! 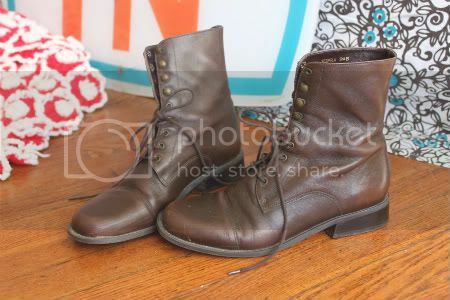 Our first stop was an animal shelter thrift shop where I found these boots for $2! I also picked up a floral sun dress from the 90's that needs to be reworked and found a vintage shirt for Brett. Then we stopped in at Bear Market and I found this fun vintage blanket. It's headed to my MIL's Etsy shop sometime in the next few weeks. 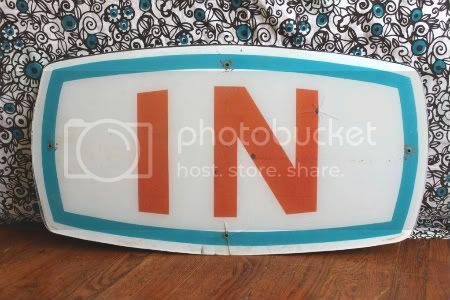 The vintage 'IN' sign was the bargain of the day and was picked up near Lebanon at a larger flea market. I'm not sure where it's going in the house yet but I love it, cracks and all! Most of all, we had a fun little family adventure on our way home that involved driving through a field, a derelict building, and a pretty sunset. Photos to come. I'm posting January sponsor giveaway's later tonight! I hope you're having your own adventures this weekend! love these finds! I found vintage snack trays this weekends... seriously love them...! love the boots & blanket! so neat that your MIL has a vintage shop!! $2.00 for those boots! NO WAY!!! So jealous. We have NO good thrift stores here in South Carolina. You always, always find the best treasures. Sounds like you had a blissful day. The finds are delightful.I love family days and visiting friends too-it warms the soul. you always find the coolest loot! Your MIL has an etsy shop?! How awesome!! Love the boots! What a bargain. 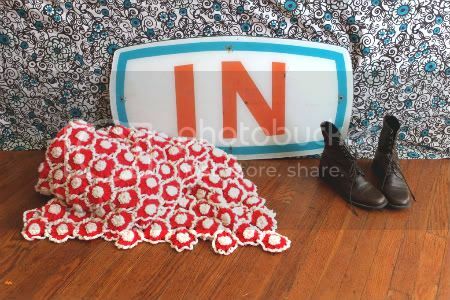 i LOVE the shoes AND the "in" sign! Awww Bear Market!! That's where I first started loving flea markets and vintage! My first find was a pair of super cute cowgirl boots for $2.